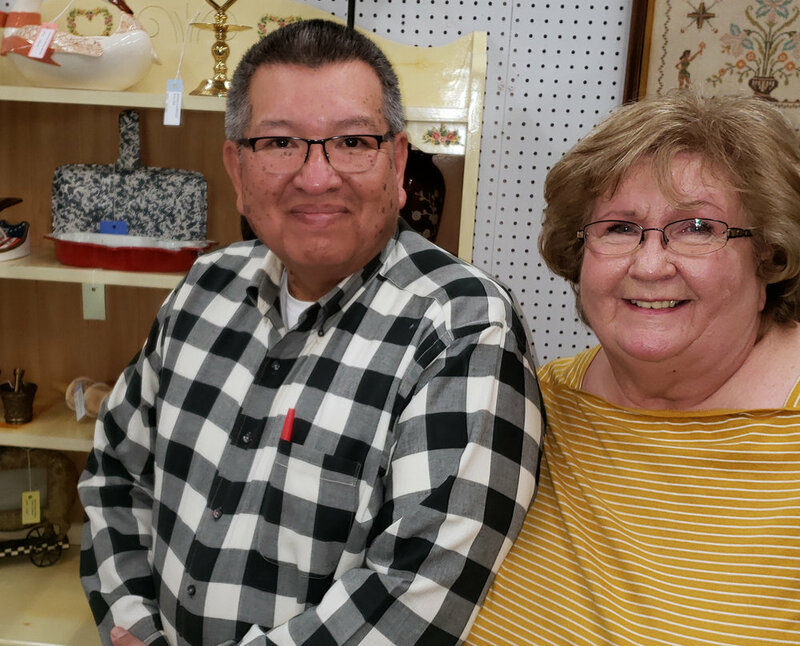 An interview with Peter and Verma Tiger, dealers at River City Trading Post, Jenks, OK.
Peter and Verma Tiger met more than 33 years ago at the bowling alley and he has been the "Kingpin" of her heart ever since. Verma recognized Peter's name when she saw it on the board as "Bowler of the Week". Her friends encouraged her to ask him for bowling lessons and nine months later they were married. That's just how they roll! Verma is a nurse and Peter is the Director of Radiology for the Muskogee Creek Nation. Over the years they have split their spare time between bowling, volunteering for Oklahoma Westie Rescue and junking. They take day trips to scour small towns for treasures and go to auctions and garage sales looking for deals. The Tigers have had a booth at River City Trading Post for 5 years. They have impeccable taste and if you stopped by one of their two booths, you might find Native American Art, Frankoma Pottery pieces, Vintage Black Americana or Beatles Memorabilia. RC: How did you get started buying and selling? RC: What is your most treasured item that you have found at a sale? PT: I bought a Bimini Art Glass cruet. It still had the stopper. It was perfect. I bought it for $5.00 and I kept it for two years. I wish I had it back. I truly wish that I hadn't sold it. We've found so many things through the years. RC: Do you both collect? VT: I collect Russian Stacking Dolls. Peter Collects Vintage guitars and Beatles memorabilia. RC: Peter do you play guitar? PT: Not very well. I've tried. I'm awful, but I have beautiful guitars. I have a 1958 Epiphone Coronet. RC: Favorite place to vacation? PT: Reno and Alaska. We go to Reno more often. I am a competitive bowler. When in Reno, we started going into California to look for yard sales. Some sales even offered wine. We've accepted! RC: Four things that you can't live without? PT: 1. Well, Books, golf and bowling. 2. I couldn't live without my pets. VT: 3. It would be hard to live without yard sales. You have to kiss a lot of frogs. PT: 4. It would be hard to live without each other. VT: It is always so bright with so much variety. The people are just so friendly. PT: What I like about it is that I spend money here! (laughing) There is a lot of diversity and if you are looking for it, it is probably going to be here. We're both really happy here! RC: Do you have advice for new vendors? VT: Buy what you like. If you don't sell it, you still have it. PT: if you find a bargain, pass it along to the customer. "A fast nickel is better than a slow dime."